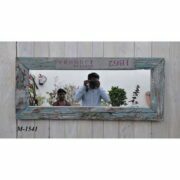 Vintage doored mirror in pale green and cream. 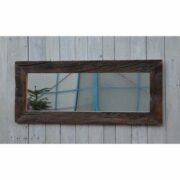 This has been made from an original old carved door which has had a frame built around it and mirror set into it. Due to its age the paintwork is flaky with most the colour being cream and little areas of pale green. 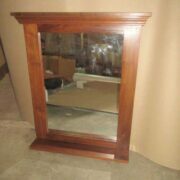 It has metal hinge banding and small wooden knobs to open the doors and reveal the mirror behind. 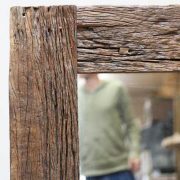 Also attached is a large wooden catch to hold the doors closed.